A feast of wild strawberries, with a hint of decadent sparkling wine, combined with geranium and rosemary oils to lead your mind along a forest path of relaxing and indulgent discovery. Relax and let the cocoa and shea butters deeply moisturise. A fresh fruity strawberry accord in combination with fizzy sparkling wine notes. Directions For Use: Drop your Bomb Cosmetics Bath Creamer into a warm bath and it will fizz softly, releasing its moisturising Cocoa and Shea Fruit Butters into the water to moisturise your skin. 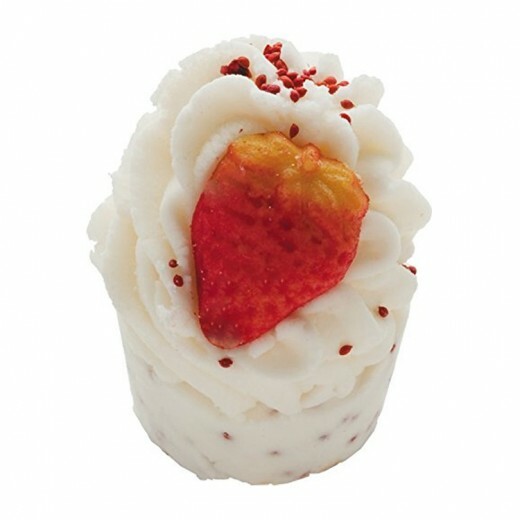 The Bomb Cosmetic's Bath Creamers also contain wonderful perfumes and essential oils to make your bath smell beautiful. Please note: This item is purchased as part of our create your own hamper facility and as such cannot be purchased separately as a single item. If you would like to purchase a pre-made pamper hamper click here.